Our unique 32-piece solid wood set of Chess Men. Each piece has its corresponding move pattern engra..
Our Basic Chess Set is complete with 15" square by 3/8" thick hardwood board and 32 chess men. 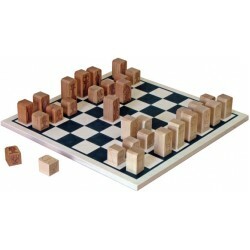 Each ..
Our Premuim Chess Set is complete with 15-3/4" square by 1-1/4" high sided game board in black and 3..